Great hotels with Dolomite Mountains. Whether intimate lodge, family run B&B, or luxury spa resort, our hotels are unique, eminently local, and hard to leave. We believe that matching great outdoor activities with wonderful accommodations provides the best way to experience everything the Dolomites has to offer. 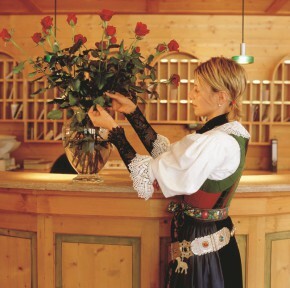 From cozy, wood-paneled hotels and B&Bs with fluffy down comforters, to luxury hotels and chalets that have perfected the art of hospitality, to alpine inns, known here as rifugios, that command the most amazing Dolomite panoramas, we find the perfect accommodations with the right mix of charm and comfort that exemplify the character of each village you visit. We hand select accommodations that best reflect the style of the region and the unique cultures found in each village. We work directly with the owners, forging strong relationships with these family-run hotels, to ensure you receive the best service and care during your stay. We choose the best-in-class accommodations within each category, providing you stays at the most sought after hotels and inns in the region. We can accommodate any request to ensure you are comfortable and well rested for each new days activities! Luxury chalet and apartment accommodations are a fantastic option for everyone from large groups, families who want to share a common living space, and travellers who simply don’t want to stay at a hotel! We have hand selected an exclusive offering of best in class chalets and apartments, notable for their high quality design and furnishings, available services, and proximity to stellar activities. Choose from fully catered and self-serviced stays, and everything in between! To view our exclusive selection of luxury chalets and apartments, click here.